I feel a sense of admiration for thru hikers each time we intersect with and/or follow a portion of the Pacific Crest Trail (PCT) when we are out hiking. They travel the entire length of the PCT, all the way from the California-Mexico border, head north through the states of California and Oregon, and on through Washington until they reach the Canadian border. The PCT is well over 2,600 miles in length and takes about five months for the hikers to complete. Plus, I am sure, months of planning before they even get started. It must feel like such a huge accomplishment when they finish. At times I find myself even dreaming of a day when we might make that same journey. While thru hiking the PCT has not yet become a real goal, I do thoroughly enjoy each and every time our hikes take us along any intersecting snippets of the PCT. 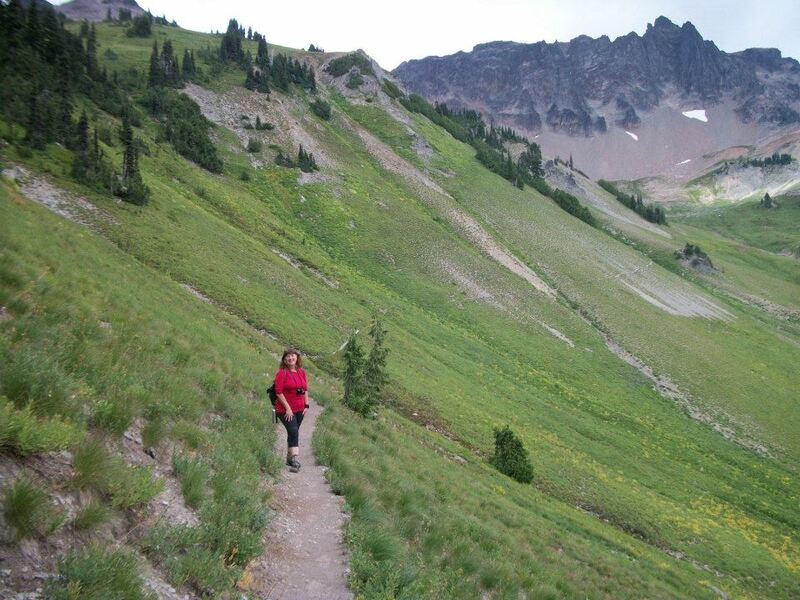 Pacific Crest Trail . . .
Our backpacking trip into the Goat Rocks Wilderness in the Gifford Pinchot National Forest (go here – https://60before60.wordpress.com/2013/09/04/56-backpacking-goat-rocks-wilderness-snowgrass-flats/ – to read more about that backpacking trip) turned out to be one of those wonderful opportunities for us to follow a portion of the Pacific Crest Trail. Having set up camp at Snowgrass Flats the day before, we followed a short trail that connected us with the PCT, and we had a beautiful hike around the Cispus Basin and on up to Cispus Pass. 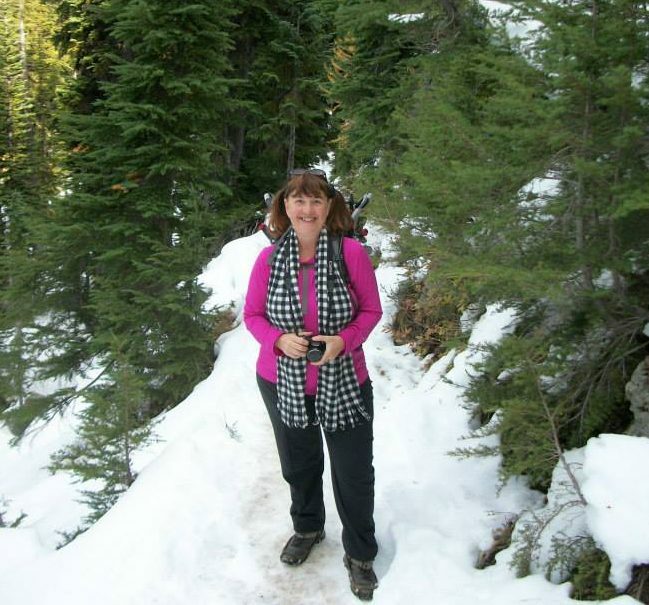 Here I am, along the PCT trail as it enters the Cispus Basin. 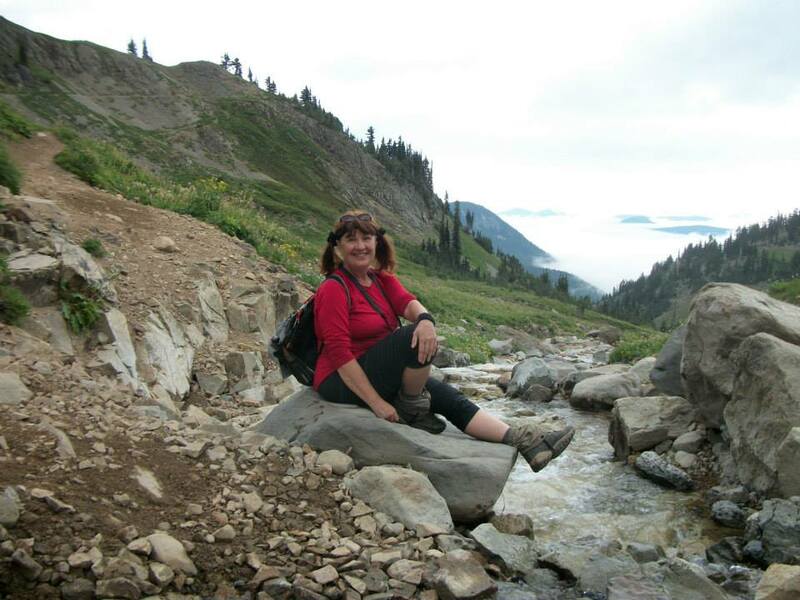 And here I am taking a break on a boulder at the headwaters of the Cispus River. We stopped for a picnic lunch in a meadow filled with wildflowers at the headwaters of the Cispus River, then continued our trek around the Cispus Basin and on up to Cispus Pass. 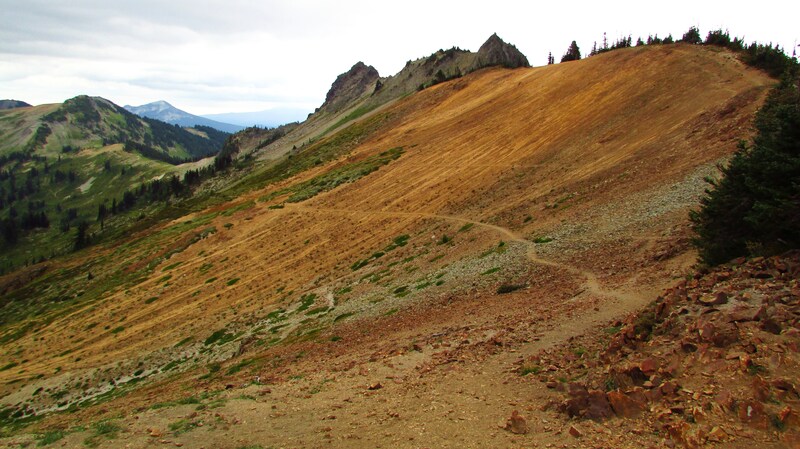 At 6,473′ elevation, we had to climb a fair number of switchbacks in order to reach the pass. But once there, oh what a view! You can see the PCT from the pass as it continues on to Nanni Ridge. Once we reached the pass, we turned around and followed the trail back around the Cispus Basin, a lovely display of clouds were rolling throughout the valley below. Was this the beginning of the predicted storm? Yes! With nearly twenty-four hours of heavy precipitation, including hours of moth-ball sized hail and flash flooding, stay tuned – expect to read more about that later! 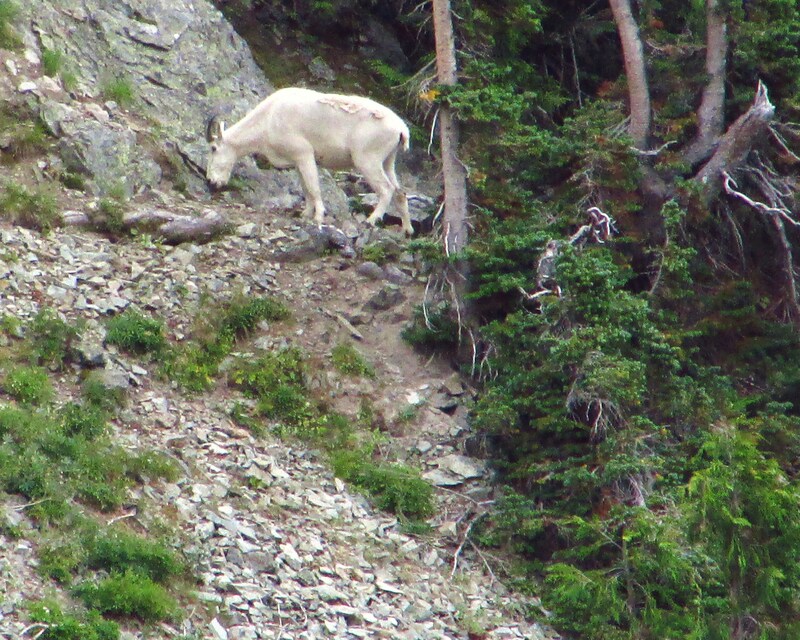 We saw mountain goats on the other side of the Cispus basin as we worked our way back to camp. 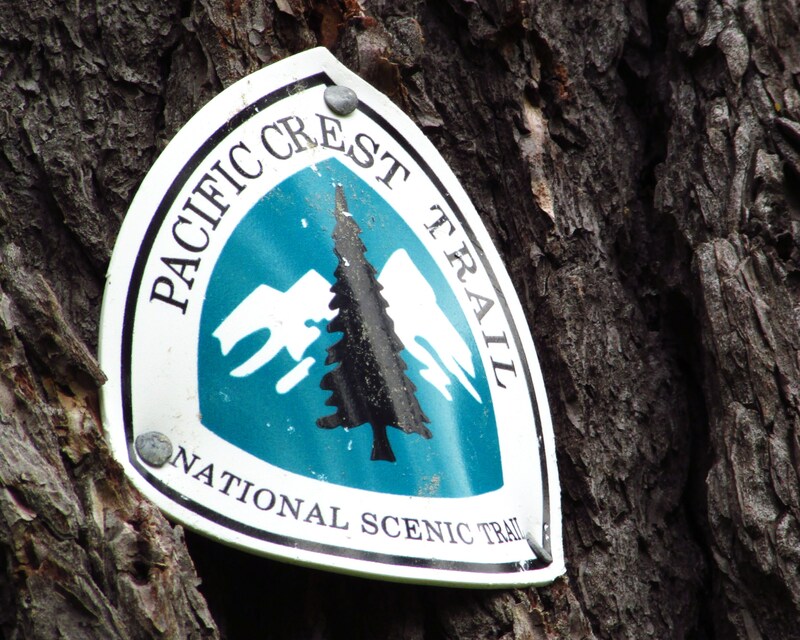 For information on the Pacifit Crest Trail, go here – http://www.pcta.org/. 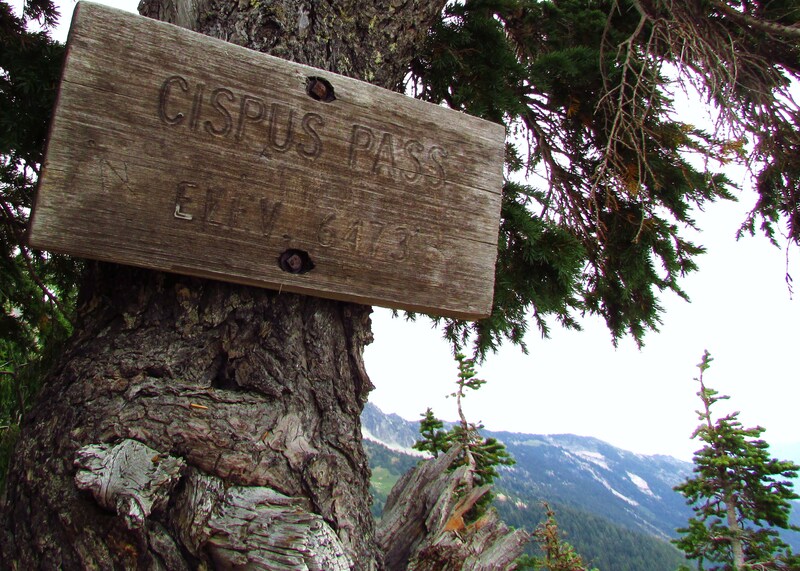 Information about the hike through Cispus Basin and on to Cispus Pass can be found here – http://www.wta.org/go-hiking/hikes/cispus-basin-cispus-pass. Happy trails to you!